How often have you eaten a mushroom that you picked yourself that morning? Or sat on a boat opening and eating oysters as you lift them from the sea? Or partaken of a seven course feast of game to celebrate the success of the chasse? 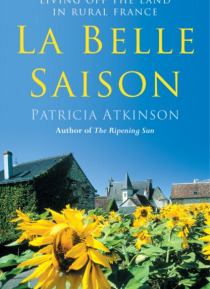 When Patricia Atkinson - bestselling author of The Ripening Sun - first moved to France, her intention was simply to establish a vineyard. Over the years, however, sh… e found herself becoming integrated into a way of life that, had she stayed in England, she would hardly have believed existed. Grounded in the rhythms of the land and the seasons, daily life in Patricia's south-western corner of France is dictated by a series of rituals and celebrations that we have long lost in our supermarket age.La Belle Saison is Patricia's eulogy to this way of life: a testament to the timelessness of the beautiful French countryside, the bounty of the land, and the generous-hearted French neighbours who showed Patricia that a simple life has many rewards. In France, every season is 'la belle saison', offering up its gifts to those willing to appreciate and look after the land.